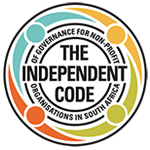 Soraya Joonas (Inyathelo: The South African Institute for Advancement), writes on 5 more elements that will contribute to ensuring a healthy and robust financial management system for your non-profit organisation. Make technology work for you. Invest in accounting software that will serve your purpose and build-in the features that are important to your organisation. Do not try to fit your financial budget data into a system if it is not generating the kind of information that you require. Insufficient software capacity will affect the efficiency of your finance function. You may find that you need to use two types of software; an accounting package and MS Excel. Make use of the most efficient internet banking technology available to you by organising to have the administrator ‘load’ payments online. The Finance Manager can then ‘approve’ these payments online. This saves the manager time while providing a second look on entries. It also allows the manager to focus on the transaction, record keeping and ensuring that policies and procedures are being followed with each transaction. Although the financial manager is responsible for maintaining robust financial systems and the Executive Director and Board is liable, it is important that all staff in the organisation realise that they play a role in the financial well-being of the organisation. Although they may not be liable, staff is responsible for accuracy and legitimacy of the information that they provide. All employees should respect financial processes and paper trails should always be kept. Internal Audit – A monthly internal audit is recommended to ensure that transactions for the past month have been properly accounted for, recorded and that reconciliations are up to date. External Audit – Although it may not be a legal requirement, ensuring that your organisation is audited by an independent external auditor once a year is imperative. The audit helps to motivate and support systems, procedures and accounting for transactions. Your donors will also be more inclined to fund you as they will have more confidence in your organisation. For most Foundations, providing externally audited financial statements is a requirement. As mentioned earlier, your Board must be presented with regular financial reports and be an active part of the budget approval process to ensure that they are meeting their fiduciary responsibilities. The day to day transactions entered into within an organisation have the end result of producing financial statements at the end of the financial year. These financial statements represent the financial status or health of the organisation. It is important to understand what the Income Statement, Balance Sheet and Cash Flow Statement means and how these are prepared. If you do not prepare these statements yourself, meet with your accountants or auditors to help you to understand the purpose of these statements so that you are literate about them and can readily answer questions from a board member, donor and/or other stakeholder. With a good understanding of these financial statements, information can be analysed to show an organisation’s strengths and weaknesses. There is a marked difference between financial accounting and financial management. The bookkeeper/administrator does not carry out the same role as the financial manager. The financial manager plays a strategic role in analysing information and providing recommendations around decision making while the bookkeeper essentially performs transactions and recording keeping. While the two roles complement one another, they are not the same. Many smaller start-up non-profit organisations turn to external experts to handle some or all of their accounting and financial management functions. Others outsource only their bookkeeping function while keeping the higher level financial management function of analysis, reporting and budget preparation with an internal staff member. While it is okay to outsource financial management, there are many benefits to having this function internal to the organisation. It is fine to hire external services to help set up systems and provide you with this capacity in the short term, but the cost of integrating this function within the organisation should be embedded within future administrative budgets. In smaller organisations, the financial manager may carry out additional functions in his/her portfolio. This may include Human resource, Information Technology and Office Administration. It is important to remember however, that as an organisation grows, administrative requirements associated with human resource employment laws, recruiting, induction, staff development and associated responsibilities with growing infrastructure also become more time consuming. With growth, the administrative burden associated with managing many grant contracts and complying with their reporting requirements becomes more demanding. The time spent on compliance and auditing processes can take away from the time available to focus on other organisational financial priorities like quality improvement and long-term planning. Therefore, it is essential to invest in the core administrative infrastructure of your organisation, especially in financial management, to contribute to the future sustainability of your organisation. It is important to ensure that the finance office is equipped with adequate staff that has sufficient analytical and strategic skills and to ensure that the finance staff configuration promotes efficiency. This directly translates into increased administrative budgets to ensure that non-profits are not left vulnerable without sufficient financial management and support systems. The rewards reaped from having robust accounting and reporting systems will benefit your organisation through donor confidence and attract funding many times over. “Financial Sustainability refers to the ability of an organisation to secure and manage sufficient resources to enable it to fulfil its mission effectively and consistently over time without excessive dependence on any single funding source.” Lisa Cannon Life Beyond Aid, ck 1996/049880/23. A reserve fund refers to the balance of unspent resources that can be freely deployed to fund future expenditures. Good financial management will contribute to financial sustainability and growing reserves. Non-profits should devise an approach to helping to build up healthy reserves. Various techniques can contribute to building reserves. These include budgeting approaches, diversifying the income mix and the timing of income received, generating undesignated income which can be saved and invested in an organisation’s reserves and through investment strategies. 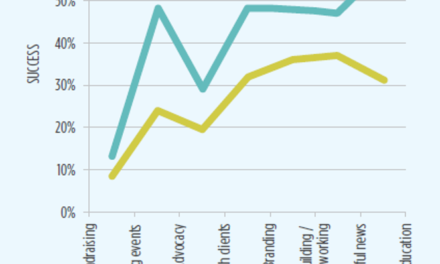 Funders are increasingly receptive to an organisation that is healthy and is making a concerted effort to build their reserves. It makes them more attractive as a long-term sustainable partner. Invest in and budget for financial management capacity building programmes as a part of an organisational strategy that will benefit your organisation. Speak with other non-profit managers or make a free appointment at Inyathelo’s non-profit clinic, to gain information that could help you with your future organisational efforts. The British Columbia Museum Association. www.museumsassn.bc.ca. Best Practices Module-Financial management. Hall and Duckles. 2005. 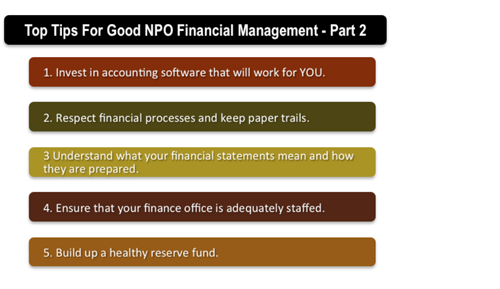 A New View of Nonprofit Financial Management. 2007 Survey of Nonprofit Fiscal Operations and Guide to Best Practices. Fiscal Management Associates, LLC. July 15, 2008. Financial management of not-for-profit organisations. CPA Australia Ltd. November 2009. Building Stronger Nonprofits Through Better Financial Management. Early Efforts in 26 Youth-Serving Organizations. Kotloff and Burd. April 2012.